Seth Godin always answers my emails - quickly & directly. Now, I am not special and for all I know Seth Godin answers everyone's email quickly and directly. Godin answers my emails quickly & directly because I make it easy for him to reply substantively in three lines or less. We both gain from his quick & direct response. I told you that parable to introduce a more general idea. People waste your attention and mine with long email signatures, or sig files. While they have our attention, they direct us to some list or item that has no quick or direct response. Look at this sig file, for example. 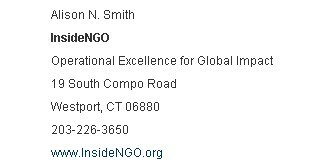 No offense meant to Allison Smith, but when you get her email, your attention is focused on this impressive list of contact information. What does the Allison want you to do with this list? There is nothing to do - her email directs you to do nothing. You comply quickly & directly by deleting her email from your attention box, and hurriedly move on. Why did Allison waste your attention? So, should your email end only with a a stock or traditional phrase? No, give your audience the option of doing something quickly & directly that will benefit both the author and reader. For example, end your email with just a simple but interesting tagline, hyperlinked to where their attention should go. Look at Perry Shoom's email signature. Perry, who has a fascinating five part article on franchising, the internet, and research as a public good, wants his readers to know that his business is providing franchise systems with comprehensive surveys. When his audience shows interest, they are whisked away quickly & directly to a page which describes his company Franchise Facts and his supports. So, where can you get some practical advice on creating interesting tag lines? One source is the Tag Line Forum, on MarketingProfs. A free registration is needed. Tell me which expert helped you the most.